H.I.R.E. 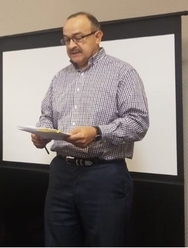 Inc, Hispanic Internal Revenue Employees, Inc. Chapter Happenings! Every year at the Annual Business Meeting, the National Board and the Chapter representatives vote on the upcoming year’s budget. The treasurer stands at the front of the room, reviews the proposed budget and everyone votes yay or nay. It’s standard procedure and usually not that exciting. This year was different. Jesse Martinez, our National Treasurer (picture on the left), proposed budgeting $5,000 for scholarships to deserving students across the country. Quietly, Rose Pruneda raised her hand and announced that she would personally pledge $250 towards the Scholarship Fund. Irma Trevino from the Rio Grande Valley Chapter also raised her hand, “I’ll pledge $200.” Carmen Nallion from Ogden quickly followed with “I’ll pledge $200.” More hands shot up, so many that Sergio couldn’t take notes fast enough. What an amazing moment. In a matter of 3 minutes, over $1,700 additional donations were raised for scholarships! It was invigorating and truly a demonstration of how the HIRE familia comes together for great causes. Please share this story with your chapter. If you or your chapter would like to pledge to the HIRE Scholarship Fund, email Jesse Martinez. Pledges during the ABM: Colorado Chapter $ 100, Rose Pruneda $ 250, Irma Trevino $200, Lara Castillo $ 100, Paula Victoria $ 100, Teresa Dominguez $ 100, Oregon Chapter $ 100, Utah Chapter $ 200, Melinda Estrada $100, South Florida chapter $ 100, Jesse Martinez $ 200. On September 20, 2017 Hurricane Maria hit Puerto Rico and the effects on the island were devastating. A national HIRE relief effort was led by the South Florida chapter and with the help of the HIRE National Board they collected donations of cash and much needed supplies from chapters nationwide. The local Puerto Rico Chapter jumped in to support their fellow members and the IRS employees working on the island. 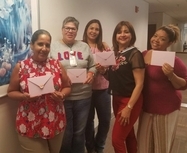 Even though many employees suffered from the impact of the hurricane, the HIRE Puerto Rico chapter identified employees with the greatest needs. For example, the chapter assisted one employee whose apartment was flooded resulting in the loss of almost all their personal belongings. In another case the chapter helped an employee with an elderly parent who had lost the roof to his home and was forced to move temporarily while his home was repaired. All the donations that were collected were used to provide assistance to those impacted by the hurricane. The chapter provided economic assistance to six local members plus two additional IRS employees (non-members). The chapter distributed three checks for $500 and five checks for $56. HIRE is committed to helping our members and IRS employees in general during the time of crisis. The local chapter continues to work with local employees to provide disaster relief assistance and career development. We thank everyone who generously donated their time, money and organized collections of supplies for the relief efforts.